Garden Revolution: How Our Landscapes Can Be a Source of Environmental Change by Larry Weaner and Thomas Christopher (Timber Press, 2016) is part of a trend in garden design to use natural plant communities as a model for gardening. In this sense, it fits together well with Darke and Tallamy’s 2014 book The Living Landscape (see my review here) and Rainer and West’s 2015 book Planting in a Post-Wild World (see review here). Where Darke and Tallamy focus on mimicking nature’s layering of plants in the garden and Rainer and West focus on creating gardens of plant communities, Weaner and Christopher focus on the processes by which plant communities develop and change, particularly the ecological process of succession. Plant communities are almost always in the process of becoming something else. Where I live and garden in the northeastern United States, for example, the processes of ecological succession mean that all plant communities are either forests or on the way to becoming forests. (As I’ve weeded hundreds of oak seedlings and thousands of tiny maple seedlings out of my flower beds this year, I’ve been reminded of just how quickly my property would revert to forest without my active intervention.) Weaner and Christopher advocate a style of gardening in which you figure out what kind of soil you have and what plant communities naturally grow in that type of soil and then design a garden that uses a naturally occurring plant community with human interventions to shape the process of ecological succession (for example, stopping the process by which a meadow would turn into shrubland and then forest by mowing the meadow once a year). I had always heard (and believed) that plants which grow in poor conditions will grow even better in rich garden soil. Not so, Weaner and Christopher argue; many plants that grow in difficult locations are poor competitors that thrive there because they have carved out a niche where they have few competitors. 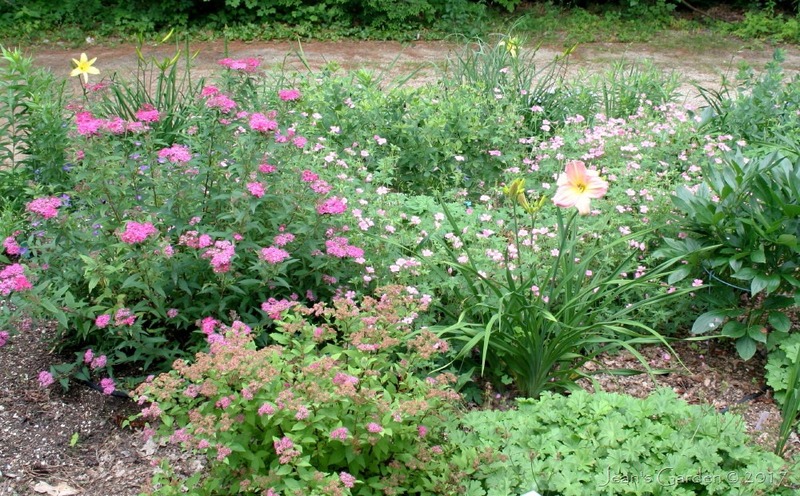 Put them in rich garden soil, and they will be crowded out by more competitive plants, often weeds. There is a tension between the idea of a garden as a composition of plant colors, shapes, and textures and the processes of plant community development. Good design requires thinking about how the plant community we are creating will change over time and an openness to those processes of change. Disturbance is an important part of the ecological process of succession in plant communities. 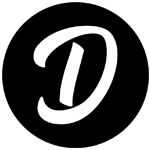 As gardeners, we can intentionally use disturbance (e.g., mowing a meadow, cutting down trees to create a forest clearing) to create desired results and we can avoid disturbance (e.g., pulling weeds) when it will create undesired results. Before I was even halfway through Garden Revolution, it was already influencing my thinking about my garden. When a clump of self-sown blue Siberian irises bloomed in a flower bed that I had designed as a composition in shades of pink and lavender, I resisted my initial impulse to dig them out. So what if they changed the color scheme of the planting? The pink irises I had originally planted in this location had never really thrived, and these blue irises were healthy and happy and looked lovely in the company of pink flowers and green foliage. It was time, I realized, to let go of my pre-conceived color scheme and let nature guide me. 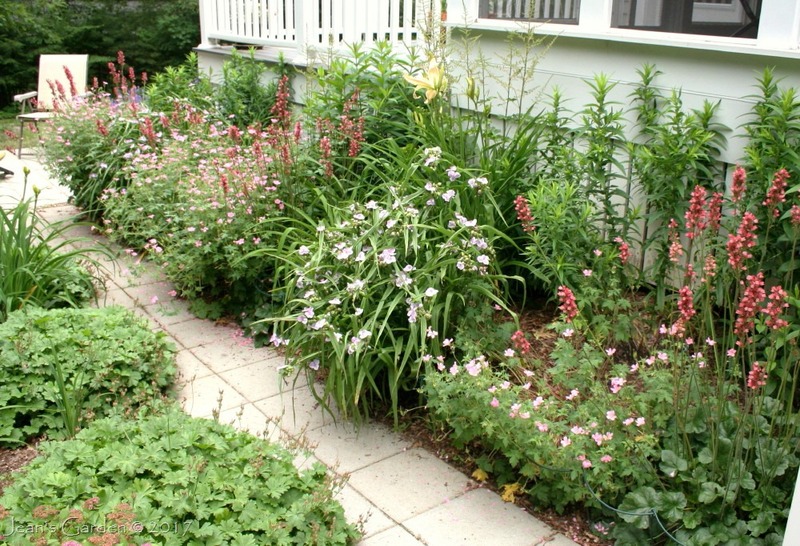 The insight that not all plants thrive in rich garden soil has shaped my thinking about how to design the new Front Slope planting that will be my major garden project next year. As I begin to work on that design, I am imagining a gradation of soil types from heavily amended rich garden soil at the top of the slope to unamended native loamy sand at the bottom. I consider any garden book that leads me to see my garden with new eyes or think about garden design in new ways well worth reading. Garden Revolution did both and I highly recommend it. I love my rural house nestled in the woods in all seasons, but the experience of living here is sweetest in summer. And that is especially true in July, when the garden reaches its peak. In many ways, mid-July is the sweet spot in the garden season. In mid-July, there is so much going on in the garden that almost every garden area looks good (even the temporary holding area for plants, shown below). But there is so much more yet to come! In mid-July, I can drink in the current beauty while also enjoying the delicious taste of anticipation. 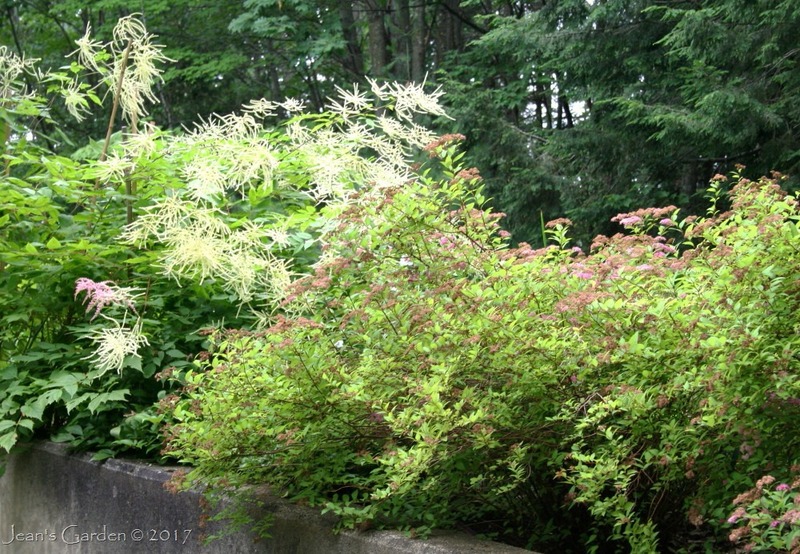 The entrance to the back garden features a lush display of goatsbeard (Aruncus dioicus), astilbe, and spirea flowers spilling over the retaining wall. In the Circular Bed at the turn into my driveway, the pastel hues of June are giving way to the strong contrasts of July. 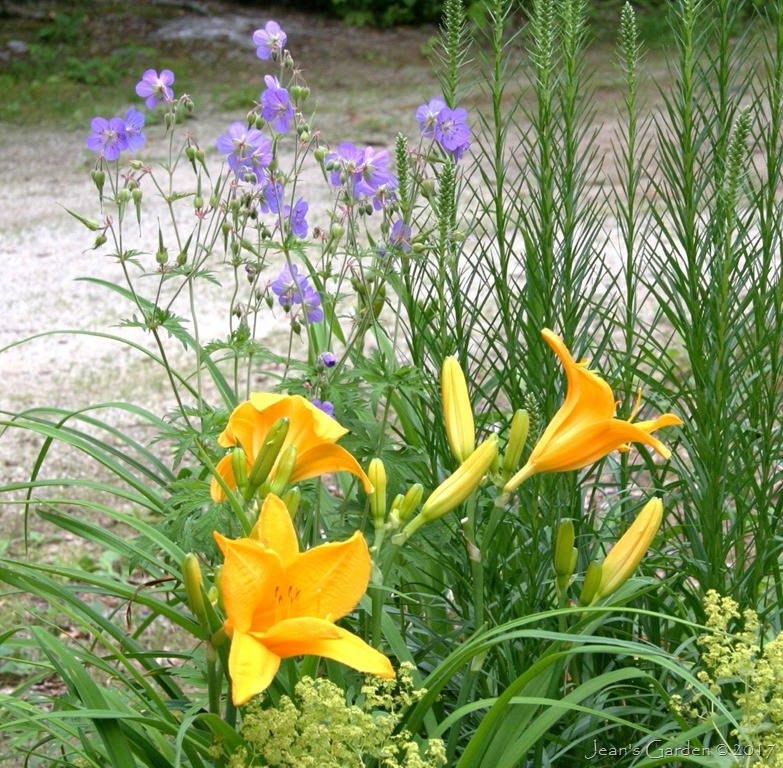 The gold color of these daylilies contrast with the blue-violet flowers of Geranium x ‘Johnson’s Blue’ (below left). 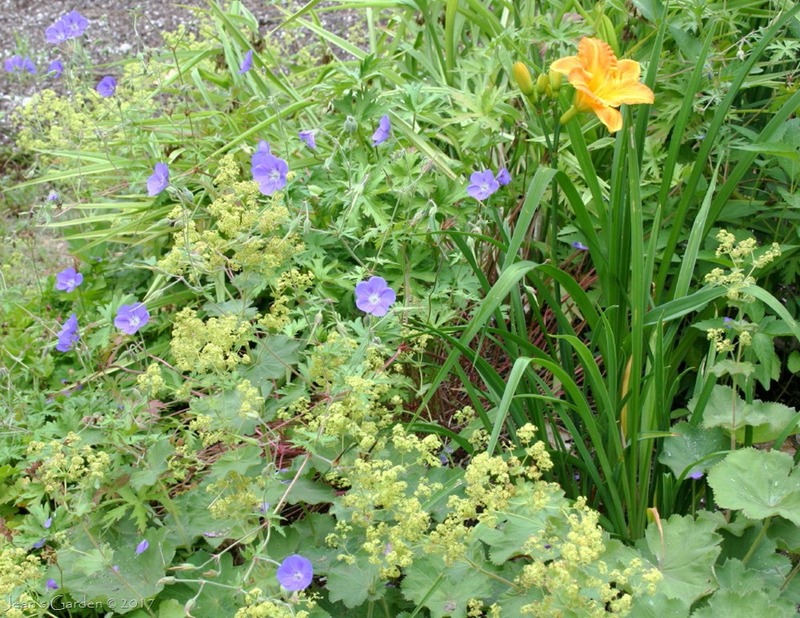 This color scheme is repeated on the other side of the circle in the blooms of daylily ‘Margaret Seawright’ and geranium ‘Brookside’ (below right). I continue to be amazed by how mature the Porch Border planting looks in it’s second year. In July, the front-of-the-border planting of Heuchera ‘Raspberry Regal,’ Geranium x oxonianum, and Tradescantia virginiana ‘Pink Chablis’ that continue to flower all summer long are being joined by the tall spires of Astilbe x ‘Moerheim’s Glory’ and the first daylily blooms. 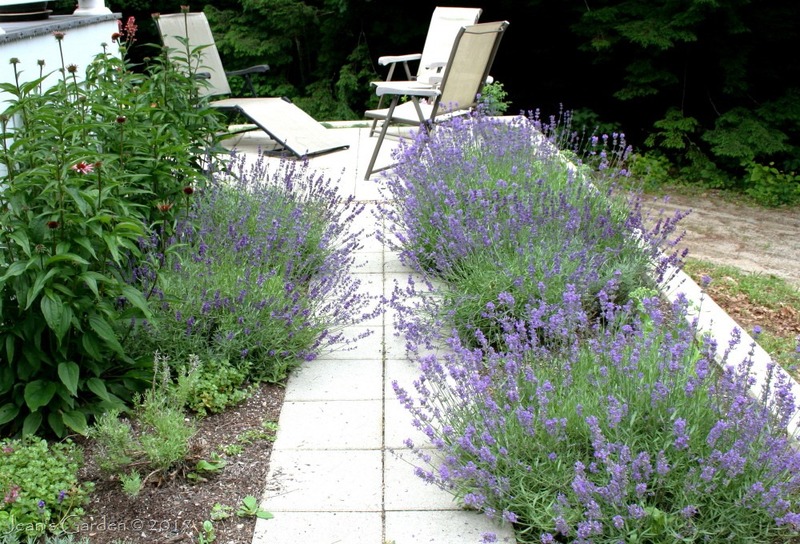 The Lavender Walk is also a source of delight in mid-July. And it’s hard to believe that the Side Slope is only in its first year when I look down from the deck on the lush display of flowers spilling down the hillside. The planting for the Fragrant Garden was completed only a few weeks ago, and it does look raw and new. 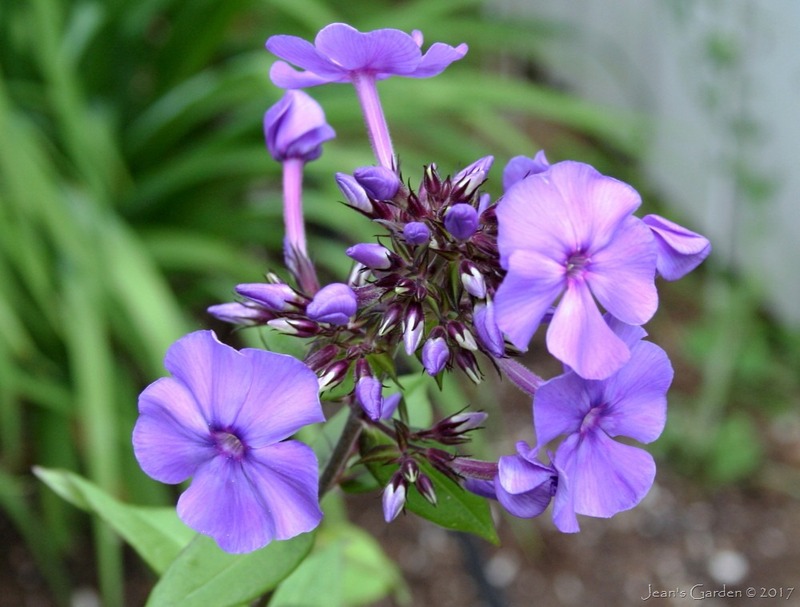 Even here, though, there are beautiful flowers to enjoy, including sweet peas growing up the side of the deck, the first phlox flowers of the season, a few flowers on rose ‘Therese Bugnet,’ and several varieties of daylilies. 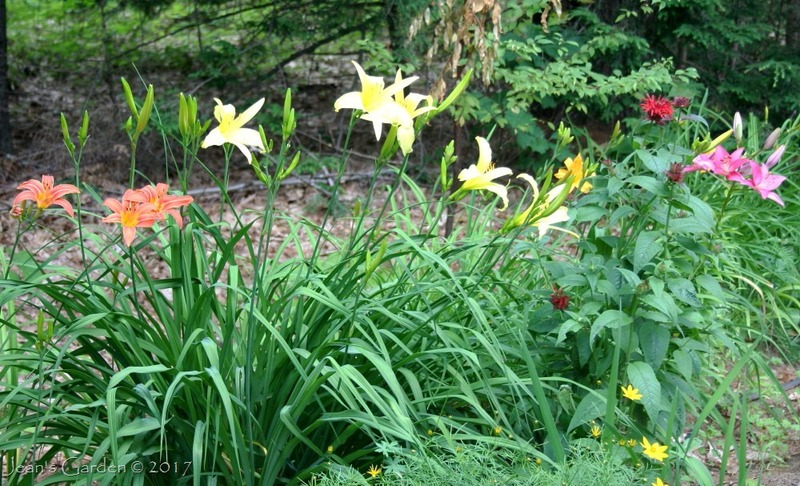 My favorite part of the July garden is the beginning of daylily season. 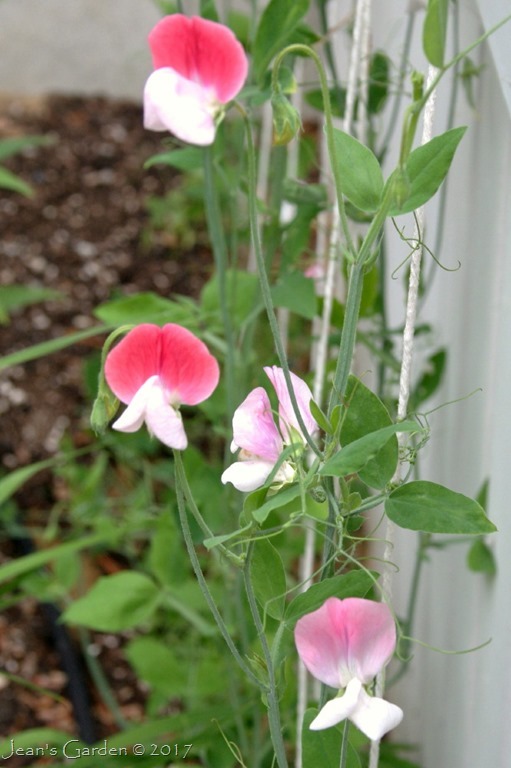 At this point in mid-July, about 20 percent of the varieties I grow have begun to bloom and two or three more are opening their first flowers each day. 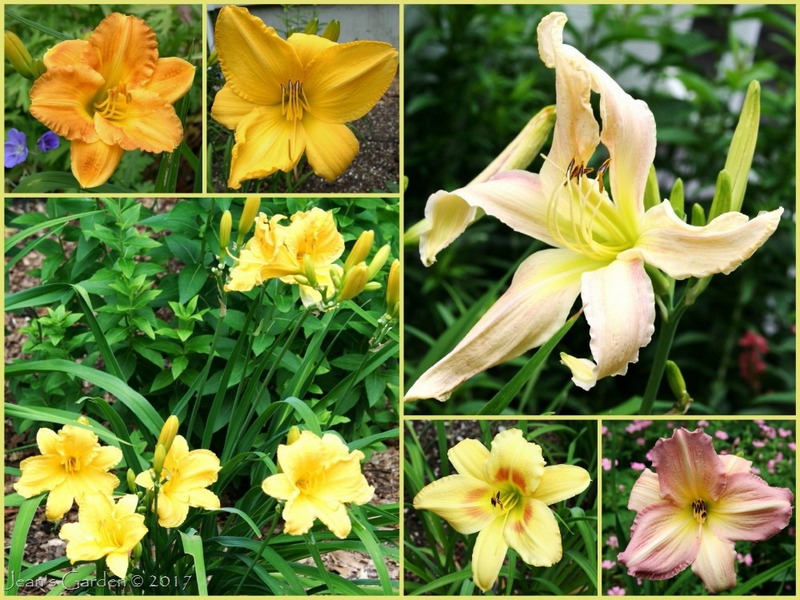 I leave you with this montage of some of my favorite early season daylilies. 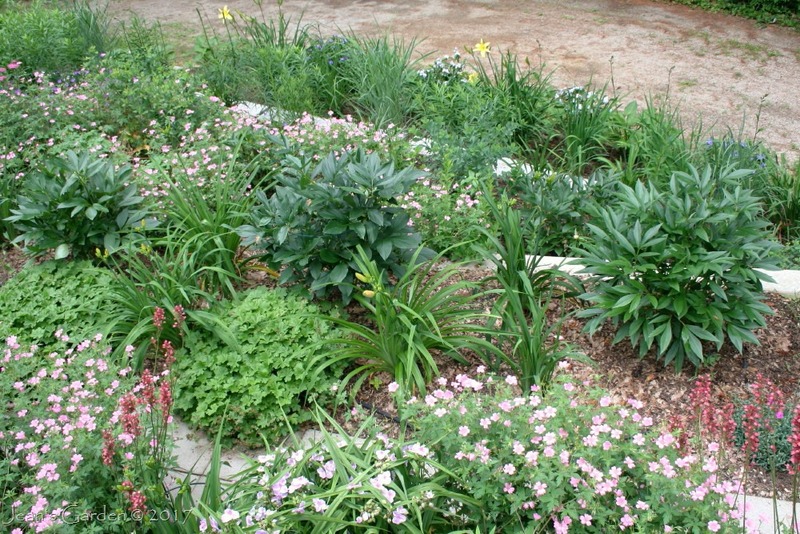 Garden Bloggers’ Bloom Day is graciously hosted on the 15th of each month by Carol at May Dreams Gardens. 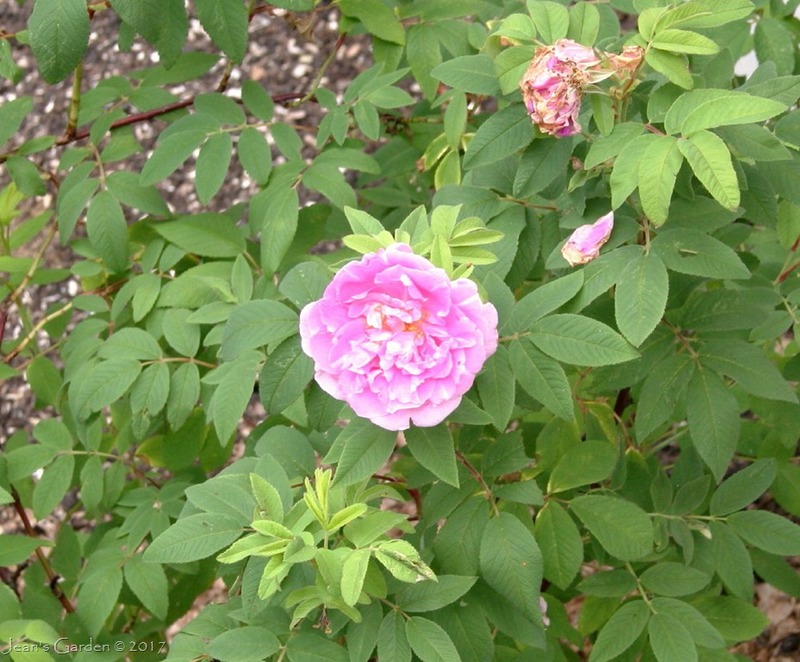 Visit her blog to see what garden bloggers from many climates have happening in their July gardens.